Polished concrete is becoming an increasingly popular flooring system. Cheap and easy to install, it has become the go to flooring system for big box stores and various commercial settings. But remember, you get what you pay for. 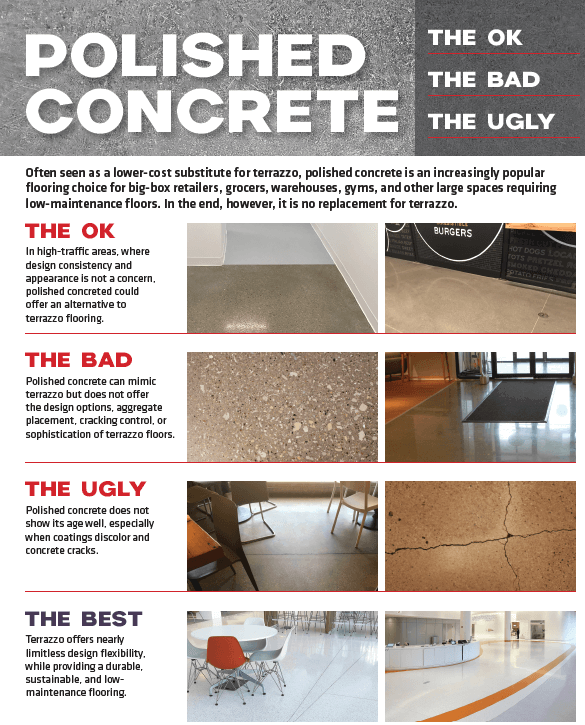 Polished concrete is prone to cracking, showing wear and tear much earlier (sometimes within weeks of installation) than other flooring systems. The cost difference between polished concrete and terrazzo is accounted for when considering terrazzo’s durability, which will show a full return on cost within seven to ten years of installation. The same cannot be said for polished concrete, which will require repair and replacement within a few years. Terrazzo is a more durable, decorative, and cleaner flooring system and outperforms polished concrete in every way.